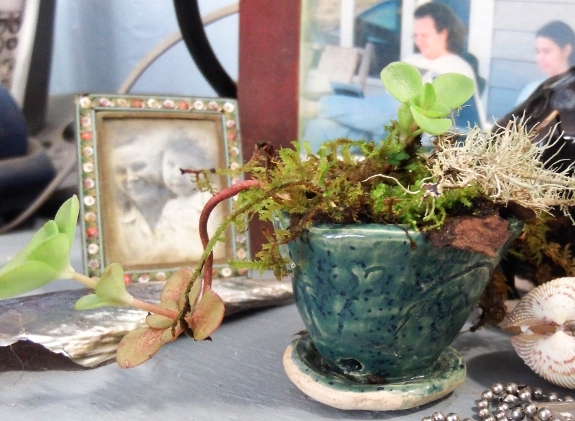 My second finished piece from clay class was a tiny pot too small for any plant except moss (and a sprig of sedum). I had fun picking three species of moss out of the woods then adding a bit of fallen lichen to complete my miniature arrangement. Surprisingly, all inhabitants have thus far survived on daily drips of water in a low-light corner of my office. The moss garden --- even smaller and more intricate than a bonsai. I absolutely LOVE the moss garden. Very Chinese/Japanese. I think you should make more of these small pots (maybe only a few inches in height but wider) and plant them as you did this one. Maybe even sell a few?